Lebanon’s capital was badly shaken Monday after a night of fighting in which factions for and against the embattled president of neighboring Syria clashed, stoking fears that Syrian unrest could spark serious violence here. The fighting, between two Sunni Muslim factions, was the worst the city has seen in four years. Two people were killed. The sounds of gunfire and rockets echoed around the city, which is criss-crossed with sectarian and factional fault lines, until dawn. Schools and universities were closed Monday as a security measure, and the city, though busy, was tense. The clash appeared to have stemmed from more than a week of unrest in the northern city of Tripoli, where many sympathize with the Sunni-dominated uprising in Syria. Daily protests and gun battles in Tripoli have sprung from resentment at the political marginalization of Sunnis as well as anger at the perceived support of Lebanon’s government and parts of the security forces for Syria’s president Bashar al-Assad. Into this toxic mix on Sunday came news that a Sunni religious leader, Ahmed Abdul Wahid, who according to local reports had campaigned in the Akkar rural area on an anti-Assad ticket, was shot and killed by security forces, along with a colleague, as he passed through a checkpoint. Sunni groups across the country expressed outrage, burning tires and closing off highways in Akkar, in the eastern Bekaa valley and in Beirut. Here, groups of anti-Assad Sunni youths who cut off a road with tires and rocks in the southern neighborhood of Tarik al-Jadeeda were stopped by armed guards from the office of a pro-Assad Sunni leader, Shaker al-Berjawi. Fighting quickly followed, with hundreds of young men opposed to Berjawi buzzing into the area on scooters, according to participants on both sides. A majority of the Sunnis in Lebanon appear to support the Syrian uprising, with most of them resentful of the dominant role of the Syrian-backed Shiite militia and political party Hezbollah in their own country. Shami’s views were enthusiastically echoed by a group of young men standing around the charred ruins of Berjawi’s office, who said that they were supporters of the largest Sunni political party, the Future Movement, which opposes Assad, and that they had fired rifles and rocket-propelled grenade launchers throughout the night. Speaking on Monday, Berjawi said that around 25 guards and members of staff were in his office when the fighting began, and that two of them were killed and 12 injured in about seven hours of shooting. He alleged that he recognized members of extremist groups among the young men surrounding his office. Berjawi said that he called on the Lebanese army to help him, but the soldiers who arrived did not intervene. 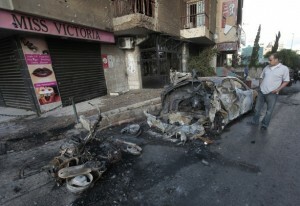 Another pro-Assad Sunni group said that its men drove Berjawi and his supporters away in the early hours of the morning. The army probably felt that it could not intervene without inflaming the situation, Berjawi said. The fighting elicited concern from Lebanese authorities, who urged calm and said that an investigation was underway into the shooting of the sheikh on Sunday, and in Washington, where State Department spokesman Mark Toner called on all sides to show restraint. But on Monday, the young men of Tarik al-Jadeeda said that although the reasons for their actions went deeper than the 15 months of bloodshed in Syria, they thought that their objectives had been achieved for the moment by driving away Berjawi and further fighting was unlikely. “We have been saving up for weapons since May 2008,” said one, who gave his name as Abu Omar, referring to the time when chunks of Beirut were taken over by gunmen supporting Hezbollah in a show of force that many Sunnis found humiliating. Well, any idiot who has to staff his obviously reinforced supposed ‘political office’ with 25 armed guards and enough ammo to last 7 hrs, and not just a secretary, must know he’s not exactly popular … hihihihihi … it sounds like it was a fort. How the hell did he get elected there anyway?? Or was he just ‘moved in’ ?? Beirut … stranger than fiction. Dateam … a guy who parked his car in wrong place at wrong time 😉 probably wondering if the swap-shops in Tripoli have enough parts for the cheap re-build.